Note: in English, the oat grain is usually refered to in the plural (oats). The red oat (Avena byzantina K. Koch) and the naked oat (Avena nuda L.) are classified by some researchers as Avena sativa L. (Rines et al., 2006). While there is a specific datasheet for the red oat, naked/hulless oats are dealt with in the present datasheet. The black oat (Avena strigosa Schreb.) is a different species. Oats (Avena sativa L.) are a major cereal grain worldwide and the 6th cereal grain after maize, rice, wheat, barley and sorghum. Worldwide annual production was 21 million t in 2012. In 2009, livestock feeding (horses, cattle, sheep and poultry) was the primary use (70%) of oats (FAO, 2013). 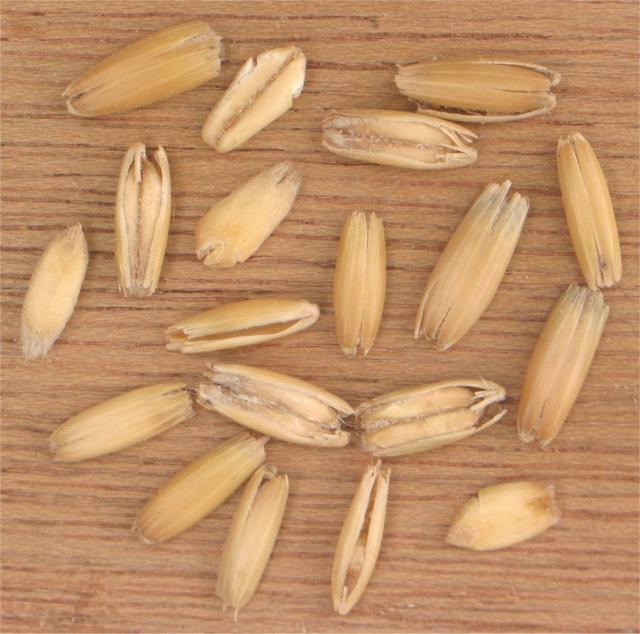 Oat grains typically consist in a long and elliptical caryopsis (groat, kernel), slightly ridged, 0.6 to 0.8 cm in length, covered with fine, silky hairs, enclosed in lemma and palea (hulls, husks) that constitute about 25% of the weight of the harvested grain and are difficult to remove (White, 1995). There are some hulless genotypes (naked oats), which have caryopses with no or little lignified lemma. Some of these hulless genotypes are sometimes considered as a separate species (Avena nuda L.) (Rines et al., 2006). The caryopses are of different colours, including white, grey, yellow or black. However, the common name "black oat" usually refers to Avena strigosa, except in France where black oats (avoine noire) are black varieties of Avena sativa that are highly popular with horse breeders and actually more common than white varieties (Sem-Partners, 2014). Oats used to be more important than they are today: world production was 50 million t in the early 1960s. Once a predominant grain for cattle and horses, oats became marginalized and oat production steadily decreased during the second part of the 20th century, due to their replacement with higher energy cereals such as barley and maize, to increased mechanization and subsequent disappearance of draught horses, and to increased specialization in agriculture requiring less crop rotation and more chemical usage (Assefa, 2006; Blair, 2011; Hoffman, 1995). Oats remain competitive in cold northern areas (for example Russia, Canada, Northern USA, Scandinavia) where there are fewer alternative crops (Rines et al., 2006). The dual purpose feed and fodder uses of the oat crop makes it valuable in certain areas, such as the highlands of tropical Africa, Australia and the USA. In these cases, the crop is cut during the first stages of growth for fodder and then allowed to grow until the grain is ready for harvesting (Assefa, 2006; Suttie et al., 2004). Oat forage is used for grazing, hay and silage, and the straw is used as animal bedding (Suttie et al., 2004). Due to the presence of hulls, oat grains contain more fibre than other cereals and their nutritional value for livestock tends to be lower. Naked oats have a better energy density and nutritional value. In addition to their use as a livestock feed, oats are commonly used for food, such as breakfast cereals, porridge, hard cakes or used a thickening agent in cooking, but they are unsuitable for bread-making (Suttie et al., 2004). Oats are gluten-free and used in diets for people with gluten-related disorders. Oats are popular for their emollient properties in cosmetics (Goujon-Henry et al., 2008). Oats are grown in more than 50 countries. In 2012, Russia was the main producer (18%), followed by Canada (13%), Poland (7%) and Australia (6%). Oats tend to be used in their country of origin, and the main producing countries are also the main consumers. In 2009, international trade accounted for only 15% of production (FAO, 2013). This may be due partly to the bulky nature of oats and their relatively low value compared to other energy and protein sources. Oats are often fed on-farm and do not enter the commercial market or appear in national statistics. In many countries, the oat crop is not intended for grain but for forage (Hoffman, 1995). Oats are mostly found between 45-65° North and 20-46° South (Stevens et al., 2004). They are grown as a spring-growing or autumn-growing crop in the cooler and moister areas of temperate regions, and as a cool season crop in Mediterranean and tropical areas. In tropical areas, high altitudes are suitable. For example, in Ethiopia and Kenya, oats are grown from 1600 m and above, and do best above 2000 m (Assefa, 2006; Suttie et al., 2004). Oats grow on a wide range of soils at temperatures ranging from 5 to 26°C, and in regions with rainfall over 500 mm (Ecoport, 2013; Assefa, 2006). However, the oat crop is not as winter-hardy as wheat. Hot and dry weather just before heading is deleterious to seed yield. Oats do better in loam soils but tolerate acidic and low fertility soils, with a pH ranging from 4.5 to 8.6. Oats have some salt tolerance (Assefa, 2006; Suttie et al., 2004; Mishra et al., 1986 cited by Ecoport, 2013). Oats should be direct-harvested as soon as the grain ripens to avoid shattering, but not before the grain contains less than 12% moisture. When harvested with less than 12% moisture, oats can be stored in dry water-proof silos and at a temperature below 20°C. Oats harvested at more than 12% moisture should be dried (aeration or grain dryer) before storage. 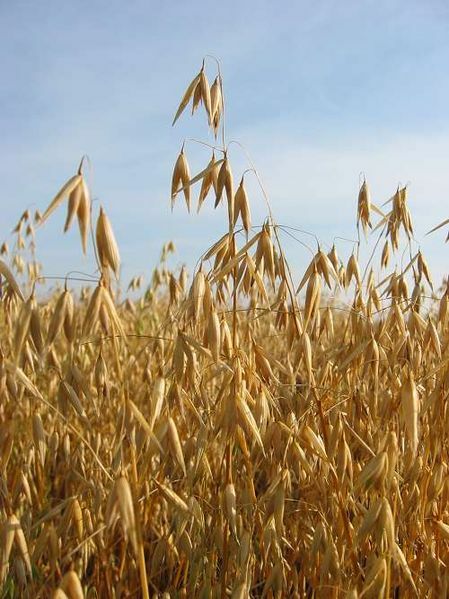 Oats can be harvested by windrowing (swathing) in dry conditions when the grain has less than 35% moisture, a method that promotes homogeneous ripening. The grain harvest has to be done ideally within 10 days after windrowing (Malik et al., 2011). Cold treatments (dehulling, grinding, rolling and cracking). Dehulling oats produces groats. Crimping oats (a light crushing process that breaks the oat hulls) is particularly popular in horse feeding. Hot-dry treatments (extruding, micronizing, roasting and popping). Hydro-thermal treatments (steam-rolling, steam-flaking, pressure cooking and exploding). Chemical treatments (sodium hydroxide, formaldehyde) (Chakraverty et al., 2003; Cuddeford, 1995). Rolling oats with a dry roller or a hammermill are both possible but dry-rolling produces less dust (Rayner, 2007). Fine grinding increases the digestible nutrient content but too fine grinding may cause digestive upsets. Fine grinding is a preliminary step towards pelletizing (Ash, 1992). There has been much debate on the effects of processing on the feeding value of oats. In some cases, physical treatments did little to improve nutritive value while thermal treatments were found too expensive (Cuddeford, 1995). The effects of processing (or absence thereof) are highly dependent on the animal species and production pathway: for example whole oats are more suitable for poultry, pigs and young cattle, whereas lightly crushed (crimped or rolled) oats are generally more suitable for cows and horses (Blair, 2011; Boyles et al., 2006; Ash, 1992). An advantage in using oats in cattle is that they require little or no processing before being fed (Blair, 2011). Because they often do not require processing, oats may be less susceptible to spoiling (Pavia et al., 2011). The high resistance of oat hulls to grinding results in a negative effect on pellet quality (higher friability) when oats are included in the feed (Acedo-Rico et al., 2010). Oats can be used in environmentally friendly no-till production systems, and have low N requirements (60 kg/ha) in those systems (Lafond et al., 2013). In the Northern USA, oats seeded with a companion legume during spring can provide hay or grain and excellent straw, while the legume remains as a summer or autumn cover crop. However, the climbing growth habit of vines such as vetch (Vicia spp.) can contribute to lodging and make harvesting the oat grain difficult (SARE, 2008). Because of their great tillering capacity, oats are more competitive to weeds than other cereals. They deprive weeds from light and smother them efficiently while requiring less herbicides, thus possibly reducing deleterious effects on oat yields and the environment (DAFWA, 2006). Oats are primarily an energy feed. However, their chemical composition can vary widely, depending on variety, climate and fertilizer practice. In particular, the nutritive value of oats is largely determined by the percentage of hulls in the grain, which varies from 20 to 30% of the kernel weight (up to 45%) and depends on genotype and environment (Cuddeford, 1995). The degree of lignification of the hulls varies between varieties (Margan et al., 1987; Crosbie et al., 1985; Rowe et al., 1988). Oats are much richer in gross energy than other cereals (for example 19.5 MJ/kg vs. 18.7 MJ/kg DM for maize), due to their relatively high oil content (3.5-7.5% DM). Oats contain more protein than maize (8-15% DM), but less than wheat and barley. Oats have a good amino acid profile that compares favourably with those of other cereal grains. Notably, the lysine content of the protein is much higher (4.3% of the protein vs. 2.9% for wheat), and sulphur-containing amino acids, threonine and tryptophan are also well represented. Oats contain much less starch (about 40% DM) than maize, wheat and barley. Naked and dehulled oats have a starch content close to that of barley (about 60% DM) and a protein content similar to that of wheat (more than 12% DM). There are also high-oil naked oats, with an oil content 5-6 times greater than wheat (MacLeod et al., 2008). The oil is mostly found in the endosperm and contains a large amount of unsaturated fatty acids (Assefa, 2006; Peterson, 1992 cited by Rines et al., 2006). The major fatty acids are linoleic (18:2), oleic (18:1) and palmitic (16:0), which together account for over 90% of the total fatty acids (Welch, 1995). Unlike other major cereals, oats have a very high fibre content due to the presence of hulls. The ADF content of oats is about 16% DM vs. 3-4% for maize and wheat and 6% for barley. The lignin content, while still low (less than 2.5% DM), is twice that of wheat and barley. The presence of hulls and their high fibre content make oats inferior to other cereal grains for high producing livestock, both due to their bulk and to the lower digestibility and energy density. Oats remain a valuable feed, for example for young ruminants, poultry, sows and horses. In some cases, processing can help to improve their feeding value (Boyles et al., 2006). Naked oats as well as hulless genotypes developed in the last decades of the 20th century contain considerably less fibre (ADF less than 6% DM) and have a better nutritive value (Assefa, 2006; Boyles et al., 2006). Winter-sown varieties, due to their higher oil content, have higher energy values than spring-sown varieties (Wainman et al., 1975 cited by Cuddeford, 1995). The composition of oats depends on agricultural conditions: for example, protein, K and NDF content were higher with optimal N fertilization than without N fertilizer (Givens et al., 2004). Oats are rich in starch and may cause acidosis and enterotoxemia in ruminants, particularly young ones, that consume large amounts of them. Attempts to self-feed whole oats may result in scouring, bloat, and occasionally death (Boyles et al., 2006). However, due to their lower starch:fibre ratio, oats are safer than wheat, triticale and barley. High inclusion rates are possible when oats are introduced progressively in the diet in combination with hay (Lean et al., 2013; Walker, 2006). As with other grains, abscessed livers have been reported on high grain cattle diets with oats as the major concentrate source (Boyles et al., 2006). Oats are rich in pentosans (including ß-glucans), which are polymers of pentose sugars that increase diet viscosity. They can cause digestive problems in monogastric species and, in particular, sticky litter when fed to poultry (DAFS, 2012). Appropriate enzyme supplementation is required to avoid these adverse effects (Blair, 2008). Though oats are less susceptible to fungal diseases than other small grain cereals, it was found that mycotoxin contamination of oats by T-2 and HT-2 trichothecenes and deoxynivalenol (DON) was higher than in other cereals, with a longer infection period. In Scandinavia, DON levels in oats reached 25000 µg/kg, with a T-2 and HT-2 contamination caused by Fusarium langsethiae that reached alarming levels (Bjornstad et al., 2008). In a 10-year survey in Scandinavia, DON levels in oats exceeded food regulatory levels in 28% of cases (Linblad et al., 2012). A 2005-2009 survey of European oat mills found mycotoxin levels in oats to be about 94 µg/kg. Processing (flakes, oat meal) reduced the T-2 and HT-2 levels by more than 80% and alkali treatments significantly reduced their toxicity (Pettersson et al., 2011). In 2013, the EFSA stated that exposures to T-2 and HT-2 mycotoxins were unlikely to be a health concern for ruminants, rabbits and farmed fish, and of low concern for pigs, poultry, dogs and horses (EFSA, 2013). Oats are a valuable feed for ruminants used to feed beef cattle, dairy cattle and sheep. In the USA, 18% of the dairy farmers reported using oats (Dann, 2010). Oats are a popular creep feed in the Great Plains of the USA and are considered to be a good feed for growing cattle. For beef cattle, oats may constitute 50-70% of the grain mix while cattle are becoming accustomed to a full feed. The level of oats should be reduced over time to 20-30% of the diet. In finishing cattle, good quality oats can be used at levels up to 1/3 of the concentrate intake without affecting growth and feed efficiency (Boyles et al., 2006). In Australia, oats are a traditional feed for sheep and are used as supplementary feed for grazing animals, whether growing, fattening or at lambing time (Cuddeford, 1995). The high gross energy content of oats is offset by their high fibre content, resulting in a lower OM digestibility (77% vs. 88, 83 and 89% for maize, barley and maize respectively) and lower ME content (12.2 MJ/kg DM vs. 13.1, 12.4 and 13.6 MJ/kg DM for maize, barley and maize). The protein value of oats is lower due to a lower protein content and high N degradability (81%, Sauvant et al., 2004; Herrera-Saldana et al., 1990). The nutritive value of naked oats is higher by 20-30% compared to hulled oats (Sauvant et al., 2004). This favours their inclusion in diets when voluntary intake is limiting, such as with dairy cows. However, high inclusion rates of naked oats are not recommended, as their high lipid content may have an adverse effect on fibre digestion (Martin et al., 1988b). Despite their lower ME and metabolizable protein supply (Gozho et al., 2008), oats can be a competitive cereal source relative to barley for dairy cows, in terms of milk and fat yield (Moran, 1983; Lampila et al., 1986; Antila, 1986; Antila, 1990, all cited by Cuddeford, 1995). Oats provide less saturated milk fatty acids (Moran, 1986; Martin et al., 1987). The utilization of wheat distillers grains with solubles by beef cattle was optimized by blending with 25% oats (Damiran et al., 2013). The replacement of maize grain by up to 30-40% oat grain in high concentrate diets did not affect digestion in crossbred cattle (Dutta et al., 1992), or growth performance of feedlot lambs (Borges et al., 2011). However, oats gave a lower performance when they replaced barley in starter feeds for calves (Bush, 1989), and in fattening diets for bulls (Latrille et al., 1983), or when they replaced sorghum in diets for finishing steers (Faturi et al., 2003). Oats appeared less efficient than good quality lucerne as supplement for ewes at lambing (Holst, 1987), or for growing sheep (Round, 1988). Processing oats may in some cases have positive effects on cattle and sheep performance. However, such effects are often limited, and processing costs may cancel much of these advantages (Boyles et al., 2006; Cuddeford, 1995). Physical processes such as grinding, rolling and cracking have variable and often debatable effects on the nutritive value of oats (Cuddeford, 1995). Calves chew oats sufficiently well until approximately 10 months old and little or no benefit is gained from processing them prior to this time. Grinding oats is usually not required for young calves, unless the grain fed with the oats is also ground (Boyles et al., 2006). In dairy cattle, dry rolling had a strong positive effect on OM digestibility (Nordin et al., 1976) but a negligible one in steers (Toland, 1976). In grazing dairy cows, crushing did not improve milk yield, and it depressed milk fat production (Hodge et al., 1984). Compared to whole grains, hammermilling oats did not affect production of dairy cows at pasture (Valentine et al., 1989). In beef cattle, feeding rolled or ground oats to yearlings resulted in a 1% improvement in feed efficiency compared to feeding oats whole. Some studies found that beef cattle fed whole oats consumed more grain per day but gained at the same rate compared to cattle fed rolled or ground oats. Fine grinding oats, coupled with pelleting, improved performance of growing cattle over either whole or ground oats. Studies have shown that gains can be improved by 11% and feed efficiency by 13% with grinding and pelleting, compared to feeding oats whole (Boyles et al., 2006). In sheep, no positive effect of processing on OM digestibility has been recorded (Orskov et al., 1974a; Orskov et al., 1974b). Several authors have concluded that, in most situations, oats should be given whole to ewes, whereas rolling is required with wheat and barley (Vipond et al., 1985; Chestnutt, 1992). Dry heat processes (extruding, micronizing, roasting, popping) and hydrothermal processes (steam rolling, steam flaking, pressure cooking, exploding) do reduce the rumen degradation rate of starch, but have only limited impact on the protein and energy value of oats (Owens et al., 1997; Sauvant et al., 2004). In the 1980s, alkali treatments were shown to be promising, since they increased the digestibility of the fibrous layers, making the starchy endosperm more available. Treating oats with 4.5-5% NaOH (Orskov et al., 1980) resulted in non-significant increases in DM intake and fat-corrected milk yield in dairy cows (Moran, 1986), and in better feed conversion, digestibility and growth rate in lambs (Orskov et al., 1981). Treatment with ammonia (up to 30 g NH3/kg oats) increased OM digestibility in adult weathers (Brand et al., 1985). The addition of 1.5% urea to low-protein oats increased intake in ewes and growth in Merinos sheep (Hodge et al., 1981). In dairy cows, treatment with formaldehyde was shown to increase milk yield and reduce milk fat content, with no effect on fatty acid composition (Martin et al., 1988a). However, in spite of these favourable results, such treatments have not been implemented in practice, probably for reasons of cost and feasibility. Oats are not a major grain in pig diets but they can be used efficiently in raw or processed forms. While their gross energy and protein content, and in particular their lysine content, are rather high compared to maize and wheat, their much higher fibre content and the presence of polysaccharides, which increase the viscosity of the intestinal chyme, tend to depress energy and nutrient digestibility. As a result energy digestibility is much lower for oats than for maize, 64 vs. 88% in growing pigs (Noblet et al., 2002), and the amount of true digestible amino acids is similar to maize and wheat, except for lysine, which is higher for oats. Processes that reduce the dietary fibre content, such as dehulling, can improve significantly the energy digestibility of oats (by 20%) and their digestible energy value (from 11.0 to 13.4 MJ/kg DM, Noblet et al., 2002). Pelleting diets containing oats improved feed conversion to a greater degree than pelleting diets containing maize (Sauber et al., 2001). Diets for growing and finishing pigs can include up to 20-40% oats. This rate can reach 60% with groats (dehulled oats) instead of whole oats (Wahlstrom et al., 1975; Lindemann et al., 1983). Maximum inclusion rates are lower for weanling pigs (5-10%) and lactating sows (15-20%), as higher rates prevent the animals from meeting their energy requirements (Rivera et al., 1978; Kornegay et al., 1981). Oat groats could be included at 45% in weanling diets without affecting growth (Leterme et al., 2010). Naked oats successfully replaced maize as the main energy source for lactating sows (Carter et al., 1998). Their high fibre content makes oats suitable for gestating sows, up to 90% of the diet, where limiting energy is desirable to reduce health and behaviour problems (Sullivan et al., 2005). Oats are sometimes included in pig diets for health purposes, 10% oats in the diet helping to minimize diarrhoea in recently weaned piglets. Oats can also protect against constipation in sows at farrowing time, and ulcers in growing pigs (Sullivan et al., 2005). Oats are a source of energy for poultry due to their large amount of starch, but the presence of hulls, fibre and insoluble and soluble polysaccharides make them more suitable for pullets and breeding birds than for meat poultry (Blair, 2008). The ME value of regular oats is close to the ME of barley (Svihus et al., 2002), while the ME value of naked/dehulled oats is higher than that of wheat (Perttila et al., 2005; MacLeod et al., 2008). In some experiments, broiler meat showed a moderate increase in fat stability as the level of oats in the diet increased, due to the nature of oat lipids (Blair, 2008). Because soluble polysaccharides increase intestinal viscosity and reduce digestibility, the addition of enzyme preparations is recommended. Enzymes added to oat-based poultry diets enhance their digestibility by about 4%, as well as weight gain and feed conversion efficiency (MacLeod et al., 2008; Palander et al., 2005; Friesen et al., 1992; Jozefiak et al., 2006). In laying hens, good-quality oats replaced barley without any negative effects on egg production. Enzyme supplementation increased the average ME of the oat diet from 11.8 to 12.1 MJ/kg (DM basis) and improved feed conversion efficiency by 3% (Aimonen et al., 1991). When naked oats were introduced (up to about 70%) in pelleted diets supplemented with enzyme preparations, growth performance was equal to that obtained with traditional diets (Farrell et al., 1991; MacLean et al., 1994). Naked oats can be included in laying hens diets up to 60% to replace maize, soybean meal and fat. The total weight of eggs produced when naked oats were included at up to 60% was equal to that obtained with a maize-soybean diet, and were reduced by only 4% in a diet with 80% naked oats and no soybean meal (Burrows, 2004). It is recommended to avoid the inclusion of oats during hot weather because of a higher heat increment during digestion, which can result in reduced feed intake and growth rate (Blair, 2008). Oats used to be commonly used in familial rabbit production in Europe (Aitken et al., 1962; Varenne et al., 1963). They are still used in commercial and experimental diets, mainly in East European countries, either as the only cereal grain of the diet or in association with barley (Niedzwiadek et al., 1977; Mukhametgaliev et al., 1985; Struklec et al., 1995; Volek et al., 2007). At the 2008 and 2012 World Rabbit Congresses oats were used in 11 out of the 97 reported experimental diets, with an average inclusion rate of 11% (Lebas et al., 2009; Lebas et al., 2013). In experimental or commercial diets, the inclusion rate could reach 12-15%, and up to 30%, with no problems being encountered, for both breeding and growing rabbits (Lebas et al., 1977; Vakulenko et al., 1985; Lopez-Bote et al., 1998). The inclusion rates increased to 45% without depressing growth when the diet was correctly balanced (Falcão-E-Cunha et al., 1996). Oats are palatable to rabbits. In free-choice trials, they are generally preferred to barley and always to maize or wheat grain (Jensen, 1989; Rowley, 1963). Rabbits fed exclusively with oats and fresh forage (alfalfa, clover or cabbage) made good growth (Akram et al., 1989; Tsutsmi et al., 1967). This is probably due to the relatively high level of sulphur-containing amino acids in the oat protein: about 4.7% on average, above the recommended level of 3.75% (Lebas, 2004). A side effect of feeding rabbits exclusively with oats and cabbage is the production of an acidic urine free of sediments (Block et al., 1962), while rabbits fed a commercial rabbit feed produce alkaline urine with calcium sediments (Cheeke, 1987). Offered as the only feed (+ 1.5% limestone) to weaned rabbits, oats gave an acceptable growth rate, but caused a deficiency in vitamin A after several weeks, which could be alleviated with an appropriate supplement or by feeding cabbage (Pirie et al., 1946). When introduced in well-balanced diets and compared to barley, growth rate, slaughter yield and meat composition were similar with both diets (Jensen, 1980; Akram et al., 1989; Lopez-Bote et al., 1998). Longissimus dorsi drip loss and oxidation susceptibility were reduced, thus improving meat quality (Lopez-Bote et al., 1998). The high fibre content of oats compared to other cereal grains is the likely cause of the lower mortality observed in growing rabbits fed oats (Sanchez et al., 1981). Oats are a choice feed ingredient for horses and are often the standard by which other grains are evaluated (Cunha, 1991). Oats are fed in mixtures with other grains and by-products, or they can be fed as the sole grain, sometimes with roughage such as alfalfa hay or chaff to maintain a horse at pasture during winter, or when fed out in controlled amounts during drought conditions. Oats have a soft kernel that make them easier for horses to chew than other cereals (Kohnke et al., 1999). For that reason, they are palatable to horses and ponies, who prefer them to other grains in preference testing (Houpt, 1983; Hawkes et al., 1985). When oats are the only grain in the diet, as is the case in traditional feeding systems, they are safer than other cereals as their low density and high fibre content make them more difficult to overfeed, and the grain size is more appropriate for chewing. A greater quantity of oats than of the other grains must be consumed to cause founder or other digestive problems. This property also makes them easier to use for novice horse feeders (Frape, 2004). However, the higher fibre content of oats makes them less digestible than barley and maize, with a lower digestible energy value. This low energy density increases the bulk that has to be fed to high-performance horses and small-frame horses. Horses with a poor appetite when worked hard may not be able to meet their energy requirements. Oats are also more expensive per unit of energy (Kohnke et al., 1999). Naked oats have a higher nutritional value, but it is preferable to restrict them at 10-20% of the cereal mix (Frape, 2004). In some countries, it has been traditionally recommended to store new oats for 2 or 3 months before feeding to prevent digestive troubles, though there is a lack of supporting evidence (Cuddeford, 1995). Whole oats contain the lowest amount of starch but the highest proportion of starch digested in the small intestine, ranging from 61-83%, followed by sorghum, maize and barley. For that reason, processing oats by crimping, rolling or grinding does not significantly improve the digestibility of oat starch in the small intestine (Kohnke et al., 1999). Some authors consider that processing is useless and uneconomic when the teeth are in good condition and the animal is more than one year-old (Frape, 2004). It was shown that cutting and sieving oats did not affect nutrient digestibility (Lopez et al., 1988). However, rolling or crimping were shown to improve DM digestibility by about 5% (Cuddeford, 1995). Thermal processes such as steam-flaking, micronizing or extrusion have been reported to increase nutrient digestibility by 2-5% (Lewis, 1982 cited by Frape, 2004; Householder et al., 1976 cited by Cunha, 1991). When compared to crimping, micronizing improved protein digestibility by 2-3% (Klendshoj et al., 1979) and increases in precaecal starch digestion by 14% have been measured (Householder et al., 1977 cited by Cunha, 1991). Oats have been a major component of horse diets in oat-growing regions for a long time and it has been speculated that the large working horse population before mechanization was responsible for the high levels of oat production. Indeed, horse feeding practices in the 19th century recommended daily oat allowances up to 5.5 kg per day, and even more for carriage (6.25 kg/d) or cab horses (8.5 kg/d). However, documented evidence shows that in reality horse diets in the 19th and early 20th centuries may have contained significant amounts of other grains such as barley and wheat (Cuddeford, 1995). Cuddeford, D., 1995. Oats for animal feed. In: Welch, R. W. (Ed.). The oat crop: production and utilization. Chapman & Hall. Cunha, T. J., 1991. Horse feeding and nutrition. 2nd ed. Academic Press, 451 p.
Jensen, N. E., 1980. The rabbit experiment station 1979. Progeny tests, feeding trials, lighting programme. Beretning fra Statens Husdyrbrugsforsoeg N°496. Niedzwiadek, S. ; Kawinska, J. ; Ryba, Z., 1977. Polish pellets in feeds for rabbits. Roczniki Naukowe Zoot., 4, 175-182. Pavia, A. ; Gentry-Running, K., 2011. Horse health & nutrition for dummies. Wiley Publishing, 388 p.
Perttila, S. ; Valaja, J. ; Jalava T., 2005. Apparent ileal digestibility and metabolizable energy value in grains for broilers. Agric. Food Sci., 14: 325-334. RBG Kew, 2013. Avena sativa (Oat). Royal Botanic Gardens, Kew, UK. Sauber, T. E. ; Owens, P. C., 2001. Cereal grains and by-products for swine. In: Lewis, A. J. ; Southern, L. L. (Eds. ), Swine Nutrition. CRC Press, Boca Raton London New York Washington, D.C.
Varenne, H. ; Rivé, M. ; Veigneau, P., 1963. Guide de l'élevage du lapin - Rentabilité - Médecine. Librairie Maloine Paris: 408 pp. Vargas, M.; Urbá, R.; Enero, R.; Báez, H.; Pardo, P.; Visconti, C., 1965. Composición de alimentos chilenos de uso en ganadería y avicultura. Santiago. Ministerio de Agricultura. Instituto de Investigación Veterinaria.